The National Audit of Cardiac Rehabilitation (NACR) is a BHF strategic project that aims to support cardiovascular prevention and rehabilitation services to achieve the best possible outcomes for patients with cardiovascular disease, irrespective of where they live. The NACR Quality and Outcomes Report (previously the NACR Annual Statistical Report) combines data from cardiac rehabilitation programmes in England, Wales and Northern Ireland. and presents recommendations for how to improve programmes. On the 14 February 2019, the National CVD Prevention System Leadership Forum, which BACPR are a part of, launched new ambitions for England to improve the detection and management of CVD risk factors - atrial fibrillations, high blood pressure and high cholesterol, and to reduce health inequalities. Clinical commissioning groups (CCGs) are responsible for commissioning cardiac rehabilitation and secondary prevention of myocardial infarction (MI). CCGs should work closely with strategic clinical networks for cardiovascular disease, who together with NHS England area teams are responsible for commissioning cardiovascular surgery. Cardiac rehabilitation is recommended in NICE clinical guideline 172 on myocardial infarction (MI) – secondary prevention as an appropriate intervention for people following a hospital admission for MI. It offers evidence-based advice on secondary prevention for patients in primary and secondary care after an MI. New and updated recommendations on cardiac rehabilitation, lifestyle changes, drug therapy and communication of diagnosis and advice were included in 2013. These guidelines make recommendations based upon evidence for established and new diagnostic tests and therapies for heart failure. If implemented, they offer a real opportunity to improve the outcome of patients with this condition. The proposals published in the JBS3 report are consensus recommendations, and are a collaborative effort from the British cardiovascular societies who deal with cardiovascular disease prevention. The report was written for GPs and practitioners to help guide their work with patients, in preventing CVD. The JBS3 risk calculator is a tool to help communicate the risk of CVD and the benefits of interventions, whether they are lifestyle or pharmacological. Although the JBS3 risk calculator is openly available on this website, it has been designed for use by Doctors and Practitioners with their patients. It sets out outcomes for people with or at risk of cardiovascular disease (CVD) in line with the NHS and Public Health Outcomes Frameworks. It identifies 10 main actions to improve outcomes. improving intelligence, monitoring and research into CVD and publish comparative data on the quality of care provided for patients with CVD. The NHS Five Year Forward View was published in 2014 andd sets out a vision for the future of the NHS. It has been developed by the partner organisations that deliver and oversee health and care services including NHS England, Public Health England, Monitor, Health Education England, the Care Quality Commission and the NHS Trust Development Authority. Patient groups, clinicians and independent experts have also provided their advice to create a collective view of how the health service needs to change over the next five years if it is to close the widening gaps in the health of the population, quality of care and the funding of services. A UK-wide document that presents guidelines on the volume, duration, frequency and type of physical activity required across the lifecourse to achieve general health benefits. It is aimed at the NHS, local authorities and a range of other organisations designing services to promote physical activity. The document is intended for professionals, practitioners and policymakers concerned with formulating and implementing policies and programmes that utilise the promotion of physical activity, sport, exercise and active travel to achieve health gains. 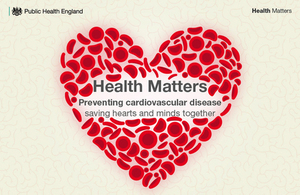 This document aims to highlight the ongoing impact of cardiovascular disease, provide an overview of PHE’s wide-ranging work in relation to cardiovascular disease and underline their key role in providing leadership and support to the NHS and wider partners. Public Health England's menu of preventative interventions is a good resource for STPs and potentially a good structure for summarising the impact of CR programmes.